"These discs combine musical excellence with elements of patriotism, morality and aid for the Allied effort in the second world war. Living in New York and refusing to conduct in territories occupied by the Axis powers, Toscanini made his own pacifist gesture by conducting several War Bond concerts, the most extraordinary being the one presented here. This Red Cross benefit concert was given shortly before D-Day in front of an audience of 20,000 people in the old Madison Square Garden. Toscanini conducted the combined forces - almost 200 players - of the New York Philharmonic and NBC Symphony orchestras, supplemented by prominent opera singers and a huge chorus of 600 voices. Everything is included here: the music, the interval announcement, Mayor La Guardia's raffle of Toscanini's baton for the Red Cross, and the applause. The palpable flow of adrenalin in the music-making reaches a climax with rousing performances of the Ride of the Valkyries - before the interval and the Sousa march to end proceedings. The booklet tells us that the concert raised the largest sum ever made at a classical music concert up to that time. Toscanini's performances are searching and exciting . . . delivered with that extra level of intensity produced at memorable concerts. . . . Additionally, the combined effect of two world-class orchestras offers great depth to the sound, especially noticeable in rich string playing and forthright brass." "This was a benefit concert for The Red Cross held in Madison Square Garden on May 25, 1944, with an audience numbering over 20,000. The Beethoven Fifth is a studio performance on VE Day (May 8, 1945). The Madison Square Garden recordings are among the best recorded by Toscanini - in particular, Act 3 of RIGOLETTO, with an outstanding cast, two full orchestras and a 600 voice chorus, drawn from New York City high schools. Toscanini was one of the best Wagner conductors of his time, and the TRISTAN excerpts show him at his best as he digs deeply into the Prelude and reaches a stunning climax. Leonard Warren, in the title role of RIGOLETTO, was then in his youthful vocal prime; he had a huge but smooth and beautiful voice with superb high notes. Milanov sings Gilda with pure and warm tone...there were few who could match her limpid voice and its lyrical tone and phrasing. It's moving and dramatically effective. Peerce sings 'La donna e mobile' with the swagger that it needs and the smoothness and alluring lyricism that was his in 1945." "Although the Verdi has been available for some time, Richard Caniell's new mastering here offers greater presence and brightness than RCA's adequate but comparatively muffled effort; the five vocalists - Warren, Milanov, Peerce, Merriman and Moscona - all gaining greater impact than in RCA's edition. But one of the major reasons for acquiring this release is the group of Wagner works that opened the concert. Particularly valuable is the Dresden version of the Overture to TANNHAUSER . . . one that Toscanini never recorded in the studio . . . then, too, the Dawn and Siegfried Rhine Journey is heard in a version slightly more flexible than any of his three studio versions . . . for the Wagner works alone, or for anyone unfamiliar with Toscanini's way with the final act of Rigoletto, this set is well worth having." "A benefit for the Red Cross, the performance at Madison Square Garden on 25 May, 1944, has become legendary. Here, the thirty-eight-year-old Milanov's amazingly keen and vibrant voice seems to leap out of her. It's not produced - it's released. Her instrument is a dramatic soprano, but not one of the thick and tough variety. Its bright, clear, pointed tone nicely suggests Gilda's youth, and the high pianissimi in the girl's death throes are no wan peeps, but rather Milanov's whole voice in gleaming miniature. And in the quartet, she lofts Gilda's agitated phrases in great, sweeping, surging arcs." 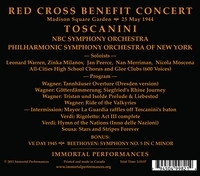 "This Red Cross Benefit concert, combining the orchestras of the Philharmonic Symphony of New York and the NBC Symphony, together with soloists and a 600-voice chorus, was presented to an audience of nearly 20,000 persons in the gigantic old Madison Square Garden arena. In this, the most stupendous musical event in the 1940s, we have here two of the finest orchestras then concertizing anywhere on the planet, playing together as one orchestra, combined to give a richness and depth to the performances such as one may wait in vain for decades to hear. This very large orchestra, around 200 musicians, surely would have wished to participate in such a worthy cause under such a conductor, and they had strength and tone in depth, of course, but that is not all: here is flexibility, sensitivity and power when called for, all held by the Maestro's uncanny and unyielding devotion to great music. Indeed, the second half of the concert - the last act of RIGOLETTO - contains music-making of such total excellence as to cause one to pause and consider if this music had ever received a performance of this quality. Jan Peerce, who at first sang Verdi with Toscanini in 1943, recalled the Madison Square Garden Red Cross Concert with affection, as well he might. There can be no doubt that the occasion brought forth, from the musicians taking part, the music-making it deserved. The five outstanding soloists had all appeared with Toscanini before, in varying capacities - but with such a cast as Leonard Warren, Zinka Milanov, Jan Peerce, Nan Merriman and Nicola Moscona at their best, we can but agree with the conductor's [memory of the event] in 1951. Milanov as Gilda is quite outstanding, but what gives this complete last act its richness, as a tribute to Toscanini and to the event itself, is the fact that this is not a series of live highlights from the opera - this is a real performance, dramatic and wholly bound up with proceeding to its dreadful and tragic conclusion. The reprise of 'La donna e mobile' as Rigoletto realises whose body it is in the sack is chilling in the extreme, and Warren (Rigoletto) and Milanov's final duet where Gilda dies in Rigoletto's arms is almost literally heartbreaking. The vitality, the élan, the concentration and consecration of forces in this Red Cross Benefit have no parallel in any concert during the war or since. What one hears is imperishable. It is only left to us to rejoice that such an aural document has been preserved and is now ours to re-experience as living history."